Hat Tip to Lew for the email directing me to Townhall who has spotlighted a Marine Hero that has been in Iraq and why he supports our actions. Liberals often like to say that "violence is senseless." Violence isn't senseless. Senseless violence is senseless. And I should know. Before being awarded the Navy Cross and having the privilege of becoming a Marine, I was a gang member. Sometimes it takes having used violence for both evil as well as good to know that there's a profound moral difference between the two. People often ask me whether I still support the war. I never hesitate when answering: "Absolutely I support completing the mission," I tell them, "Now more than ever." I was honored to have been given the opportunity to fight in Iraq on our country’s behalf. And it was that experience—and five things I saw firsthand—that illustrate the foolishness of those who would equate American military power to that used by thugs and tyrants. When I think about my gang member past I shudder in shame. But if there was one lesson I learned from my past it is that there is a profound moral difference between using violence to destroy lives and using violence to save lives. 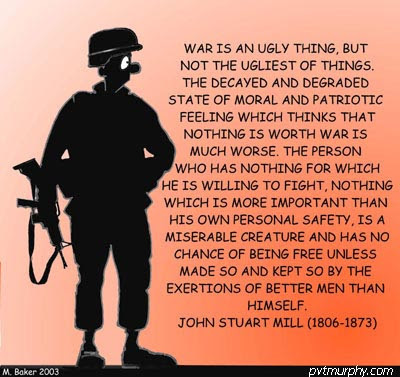 Terrorists do the former; soldiers, sailors, airmen, and Marines do the latter. Antimilitary liberals need to learn the difference between the two. Marco Martinez, a recipient of the Navy Cross, is author of the new book Hard Corps: From Gangster to Marine Hero (Crown Forum). Read it all, go read his 5 reasons he supports the war. Which leads me to something I just updated my Rush Limbaugh and the whole " phony soldiers" lie that media matters started then continued to be perpetuated by left liberal blogs as well as the democratic politicians. A comment, in my previous post left in the comments section about Harry Reid and the other Democratic politicians that continue to try to force defeat down the throats of our military. I am a soldier in the U.S. Army. I served for a year in Iraq. Senator Reid, where are these "thousands" of soldiers who oppose the war? I didn't meet them in uniform. I submit, Senator Reid, that they are a product of your putrid imagination -- phantom, phony soldiers indeed. We often use polls to show trends, one organization after another, but we do not live by polls because we prefer to hear from the troops themselves, publish their words, their comments and their emails. Polls deal with a "representative" group and depending on who is doing the poll and what questions are asked, we find that only by comparing the different polls that we can see a "trend", so we bring them to you, but we base what we write about and our positions on the words of the troops, past and present and especially those that have been to Iraq. I issued a challenge to the far left anti-military in a previous post and no one has yet been able to meet that challenge, so I will reissue it here. They either can produce them or they cannot. We separated Iraq war veterans, active military members and veterans from other times and other wars and we challenged the anti-military groups to produce the numbers that these following organizations have produced for each individual group. No one claims that there are not soldiers against our actions in Iraq but their numbers do not compare to the active military speaking up in support of the mission, their numbers do not compare to the numbers of Iraq and Afghanistan veterans that are in support of the mission and their numbers do not come close to comparing to the veterans that support the troops and their mission. When the anti-war left can start producing those kinds of numbers, then perhaps they will be given more credibility to their arguments. The American Legion's national headquarters is in Indianapolis,Indiana, with additional offices in Washington, DC. In addition to thousands of volunteers serving in leadership and program implementation capacities in local communities to the Legion's standing national commissions and committees, the national organization has a regular full-time staff of about 300 employees. They represent three million veterans and here are a couple of their statements. RENO, NV, August 31, 2007, American Legion Reaffirms Support for War on Terror. Nearly 6,000 delegates unanimously re-affirmed The American Legion’s support for the war on terrorism during the organization’s 89th National Convention in Reno, Nevada. Resolution 169 was first passed at The American Legion’s 87th National Convention in Honolulu and re-affirmed last year in Salt Lake City. It resolves that The American Legion urges all Americans and freedom-loving people stand united in their support of the global war on terrorism and united in their support of the troops. It further resolves that national commander of The American Legion disseminate accurate information to ensure the united support of the American people. The American Legion, which by its own constitution is nonpartisan, urges that the people support both the president who sent the troops to war and Congress, which authorized the action. WASHINGTON, D.C., September 11, 2007, Legion: Support Surge, Troops, Petraeus. The National Commander of the nation’s largest veterans organization today called for “much resolve and patience” by Congress and the American people on the war in Iraq after Multi-National Force Iraq Commander Gen. David Petraeus’s testimony before Congress. National Commander Marty Conatser voiced The American Legion's continued support for the "surge" in Iraq and the improving security environment. "Gen. Petraeus forcefully and effectively reported measurable gains to the joint session of the House Armed Services and Foreign Affairs Committees and his honest and professional assessment reinforced what I had seen in Iraq in the last month," Conatser said. "General Petraeus's assessment that the military objectives are in large measure being met plus his reasonable proposal for a troop draw down prove the wisdom of the “surge” strategy,” Conatser explained. Conatser said the troops he spoke with there said they’ve seen significant change and real improvements in the security environment, echoing what Gen. Petraeus told Congress today. “The Senate confirmed Gen. Petraeus to change direction in Iraq,” Conatser added. “He’s doing that but change does not happen overnight and his “surge” strategy just became fully implemented in mid-June when the requested reinforcements finally arrived. Conatser, a retired sergeant major with the Illinois National Guard, fully supports Resolution 169. The National Commander also addressed recent personal attacks on Iraq’s top military commander. With a membership of 2.7-million wartime veterans, The American Legion was founded in 1919 on the four pillars of a strong national security, veterans affairs, Americanism, and patriotic youth programs. Legionnaires work for the betterment of their communities through more than 14,000 posts across the nation. Add to that the Gathering of Eagles and Rolling Thunder. Challenge to the anti-war left: Produce any organization that represents 3 million veterans as we have just produced. Vets for Freedom is a nonpartisan organization established by combat veterans of the wars in Iraq and Afghanistan. Our mission is to educate the American public about the importance of achieving success in these conflicts by applying our first-hand knowledge to issues of American strategy and tactics—namely "the surge" in Iraq. We support policymakers from both sides of the aisle who have stood behind our great generation of American warriors on the battlefield, and who have put long-term national security before short-term partisan political gain. Vets for Freedom is the leading voice representing troops and veterans from Iraq and Afghanistan. Vets for Freedom represent more than 7,000 veterans of Iraq and Afghanistan. Here are there news articles and press releases. Challenge to the anti-war left: Produce any organization that represents over 7,000 IRAQ AND AFGHANISTAN veterans. Veterans that have fought in either Iraq or Afghanistan. Appeal for Courage is a non-partisan, grass-roots effort to communicate to Congress the troops' desire to remain in Iraq until our mission is complete. We feel calls to retreat embolden our enemy and hurt our support within the American public and Iraqi people. We accept no funding from any source, and do not speak for any group or organization other than those military members who have signed the Appeal. 3285 Active Military Members have signed this appeal. Challenge to the anti-war left: Produce 3285 Active Military Members speaking up publicly against the mission. The far left liberal anti-war, anti-military will jump on one, two or ten, military members that has fought in Iraq and some of them, such as Jesse Macbeth are, indeed, as Rush stated, phony soldiers... others are soldiers that have served and simply disagree with our actions in Iraq and the ones that DID serve deserve the respect of being listened to, but, they receive no more credibility than the thousands that are speaking up in favor of our missions, in Iraq or elsewhere. When you have 10 or 20 or even a hundred that are telling you one thing and you compare that to thousands that are telling you something else, you must use common sense. If you cannot meet the challenge and produce those types of numbers, perhaps you should stop trying to distract from that issue and start asking yourself why. Trackposted to Outside the Beltway, Blog @ MoreWhat.com, Perri Nelson's Website, DeMediacratic Nation, Adam's Blog, The Crazy Rants of Samantha Burns, Pirate's Cove, Webloggin, Leaning Straight Up, The Amboy Times, Conservative Cat, and The Yankee Sailor, thanks to Linkfest Haven Deluxe.